Who needs a 3W speaker? 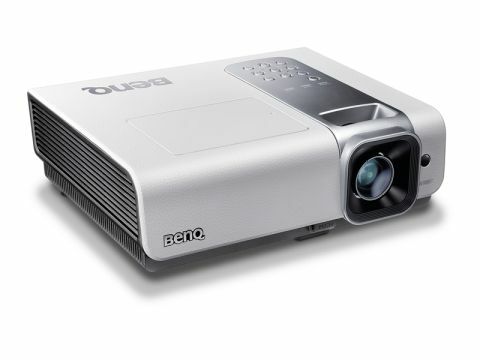 The BenQ W1000+ can be yours for roughly the same amount as you'd pay for a good 40-inch TV. And none can offer the same bigscreen thrills. The machine is capable of casting a 300-inch image thanks to the high output of its optical engine. The W1000+ is a single-chip DLP design with a redesigned colour wheel. This spins faster, which augurs well for minimisation of the dreaded 'rainbow effect' – while the coatings that colour its six segments have been revamped. The results of such tweakery are claimed to be an improved contrast ratio over the W1000 and colour fidelity. The 1.2:1 zoom lens is not motorised, so you have to adjust it from the projector itself (a built-in, cross-hatch pattern is a boon here). Inherited from the former W1000 is the comfortable backlit handset, 1080p24 compatibility and somewhat pointless 3W speaker. The superb menu system has a number of fixed presets, while another three sets of user-definable ones are also available. For these, the range of adjustable parameters is on a par with far more expensive units. Power consumption was right in line with projectors capable of similar brightness levels. We measured a 5W increase while watching live footage. Switch on the Economic Mode and energy usage drops to 200W. Out of the box the W1000+ measured commendably. There are a lot of user options, and we were able to adjust the white balance to achieve 6500K. The W1000+'s lamp can be switched from its 'normal' mode to 'economic'. Doing so yields a moderate reduction in brightness and fan noise, which, despite the faster-spinning colour wheel, isn't really that troublesome to begin with. The W1000+ produces a top-notch picture for the price. It doesn't represent the last word in black-level performance but dynamic range is unexpectedly good. With Legion (BD), I could can make out the clouds in a bright desert sky while simultaneously picking out dark features in the interior of a car. Colour is also conveyed well, and the W1000+'s resolving power is excellent. Detail is far more evident than you have any right to expect at this price level. The rainbow effect was barely evident, either. It's only some noticeable more motion judder that lets the side down. Overall, though, the W1000+ gets my vote.